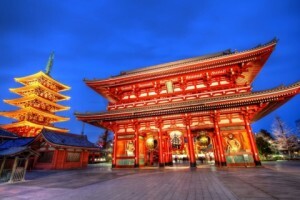 Asakusa (Jap浅草, young, low grass.) 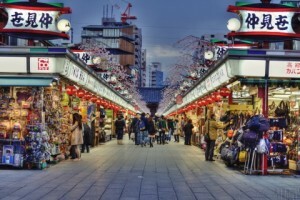 – The central district with an atmosphere of old Tokyo. The most important attraction of the area is considered a Buddhist temple Sensodzhi built in the VII century. To the temple can be reached by Nakamise shopping street, where tourists can buy different souvenirs and sample traditional Japanese food. 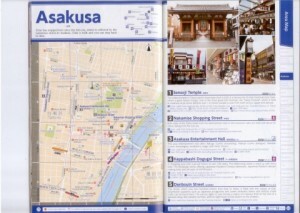 To get around Asakusa, no vehicles you do not need – everything is in walking distance from each other. 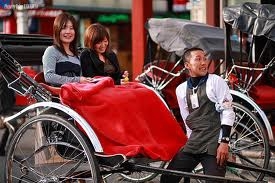 And if you decide to arrange a small tour, the rickshaws are always at your service. 30 minute trip to the area with the comments of your “guide” will cost 8000 yen for two. It is possible to agree on a long or short trips. Several centuries ago, the Asakusa district was the main center of entertainment and leisure in Tokyo. 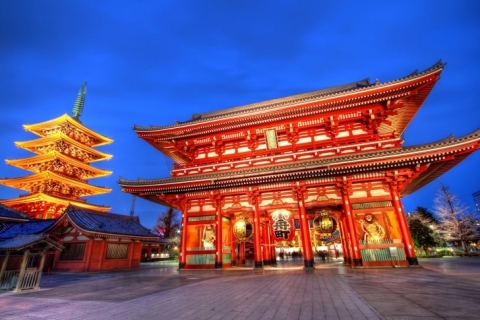 In the Edo period (1603-1867) there was a lot of Kabuki theater and there was a vast red light district. At the end of the 1890s gg. 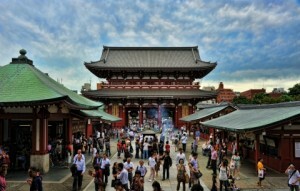 and the beginning of 1900. in Asakusa appeared the first cinemas. However, during the Second World War, much of the area was destroyed in the air raids. 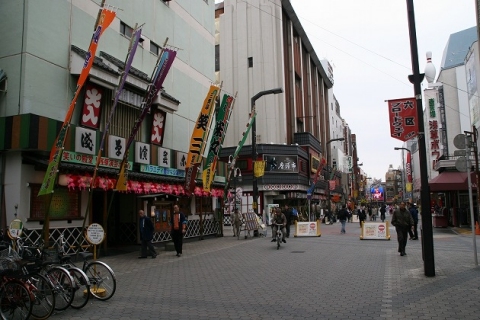 After the events of the war the area was rebuilt, but the area around Sensodzhi continued to enjoy the same popularity, the rest of Asakusa has lost its status as an entertainment center. 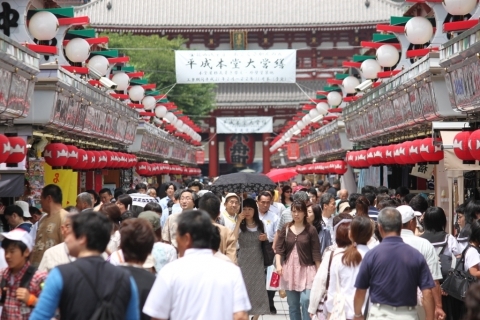 With the construction of the world-famous TV Tower Sky Tree, located on the opposite bank of the Sumida River, Asakusa again began to attract the attention of tourists. 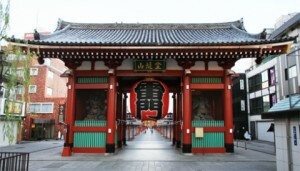 Kaminarimon – this is the first of the two main gates leading to the temple Sensodzhi. Asakusa symbol with a millennial history. 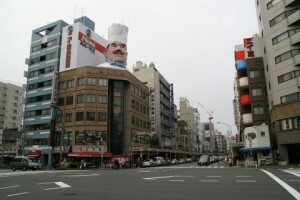 From here begins the famous shopping street Nakamise. “Senso” – a variation of reading the word “Asakusa” and the prefix “-dzhi” refers to the temple. 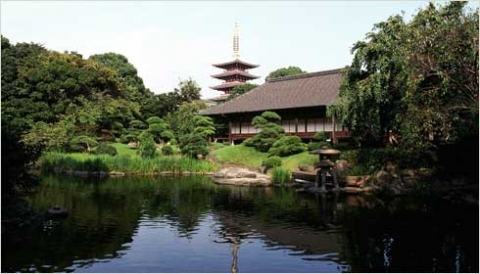 Sensodzhi Temple, built in the 7th century – one of the most famous and oldest in Tokyo, although the building that we can see now, in fact, the post-war reconstruction. 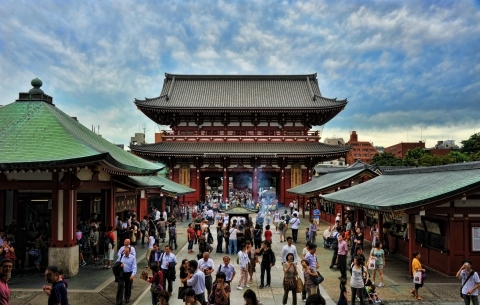 Asakusa Temple, also known as Sanja-sama, was built in the Edo period and remained intact, despite the aerial bombardment in 1945. 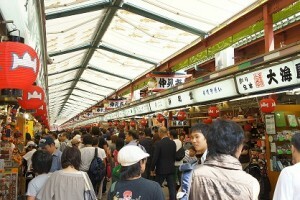 Every year in mid-May, is held here Sanji Festival – one of the most popular in Japan. Temple Denpoin located next to Sensodzhi and is famous for its picturesque garden, however, for some time now the entrance to the temple is closed to visitors. 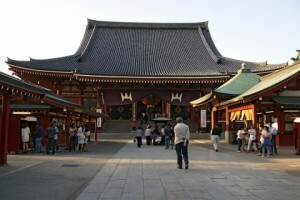 The street Nakamise, a length of 250 meters, starting from the gate Kaminarimon and ends in front of the temple area Sensodzhi. 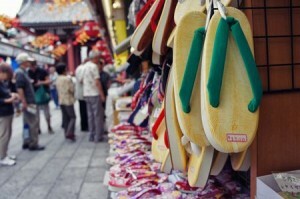 About 50 small shops offer tourists a variety of souvenirs and local food. 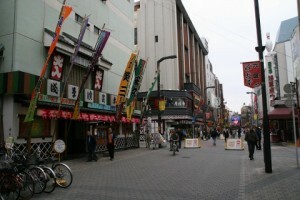 Indoor arcade Shin-Nakamise or “new street Nakamise”, runs perpendicular to the main shopping street.There are a large number of shops and restaurants. Outside Kappabashi, a length of about 2 km, you can find everything for the restaurant business: tableware, kitchen utensils, uniforms for chefs and waiters to order samples of dishes and furniture. The structure of retail and entertainment complex Rocks includes the main building and several outbuildings: Rox2G, Rox3 and Rox Dome. Many shops specialize in women’s and children’s clothing. On the ground floor of the department is working non-stop. Tobu Asakusa Station – the final train station Tobu heading to the suburbs and the northern prefecture of Tokyo, including Nikko. 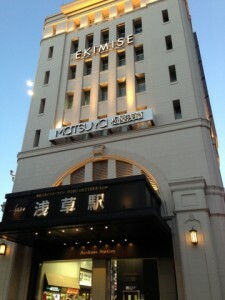 Inside the station building is the entrance to the eight-story department store Matsui. 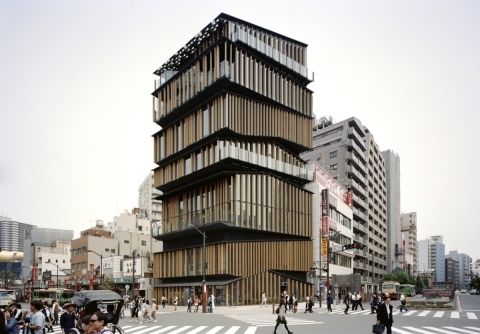 The renewed building of the Tourist Information Centre Culture Asakusa was opened in 2012. 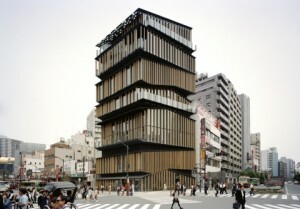 Undoubtedly, the unusual design of the building is well blended into the architecture of the area. Eight-center offers visitors the following services: free Wi-fi, information consultation in several languages, a café, access to the observation platform overlooking the temple and Sensodzhi street Nakamise. 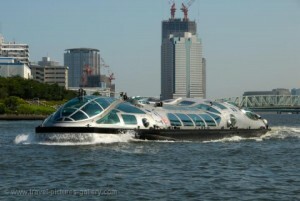 Cruises on the waterbus from the pier Asakusa to Hinode Pier (via Hamarikyu Gardens) run every 30-40 minutes. With Hinode pier have the opportunity to transfer to a ship to Odaiba (ships, following on from the Asakusa-Odaiba, much less walk). Park, stretching several hundred meters, is located along the banks of the Sumida River. 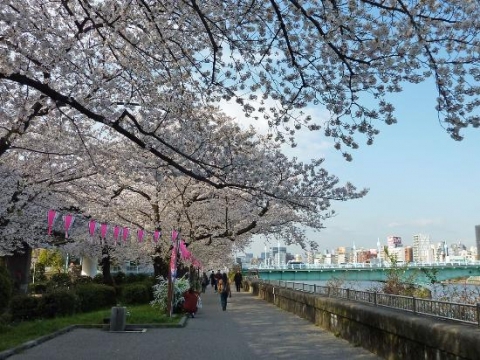 Spring come here to admire the cherry blossoms, and the last Saturday of July is held the annual fireworks festival Sumida. 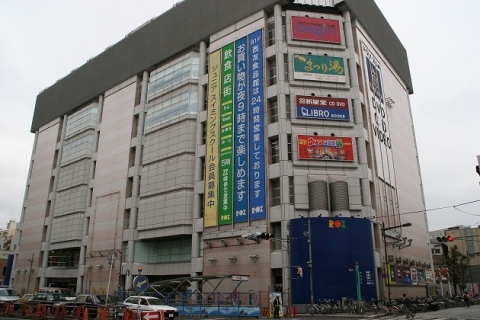 Once Rocca quarter was the main entertainment centers of Tokyo – it is here opened the first cinema in Japan – but, Rocky has lost its former popularity after the war. Now there are a lot of theaters, giving performances of rakugo in the genre, as well as cinemas and pachinko slot machine centers. 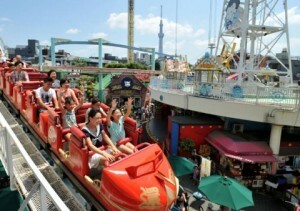 Price: 1,000 yen entrance fee + extra paid tickets for some attractions. 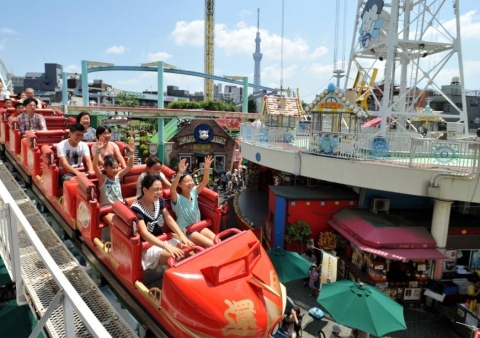 Hanayashiki Amusement Park, whose history goes back 150 years, originally conceived as a botanical garden. The park is located near the temple Sensodzhi and includes a small Ferris wheel, roller coaster, carousel and ride «Space Shot». Here is the headquarters of Asahi Breweries. 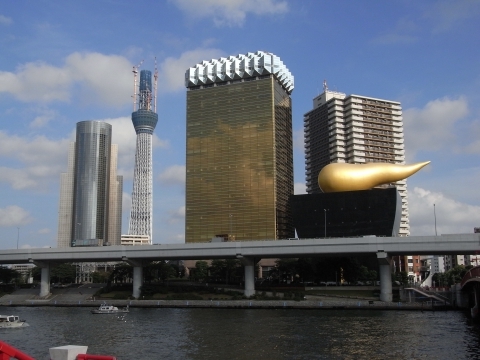 Buildings Asahi Beer Tower and Asahi Super Dry Hall with its famous sculpture Flamme d’Or were built in 1989. 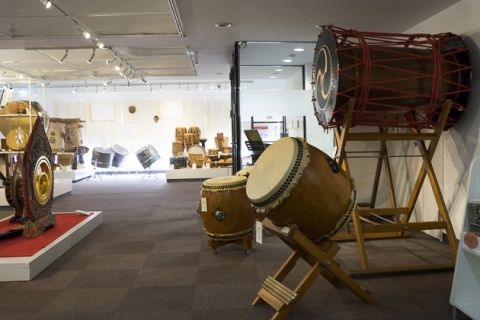 Here you can find different types of drums from around the world, including Japanese taiko drums. Some of them is allowed to play. The museum is located above the shop Miyamoto Unosuke Nishi Asakusa, selling drums and food for the festival. Prior to Asakusa station can be reached through the Ginza Subway Line, Asakusa Subway Line, Tsukuba Express and Tobu Railways, as well as on the Tokyo waterbus. 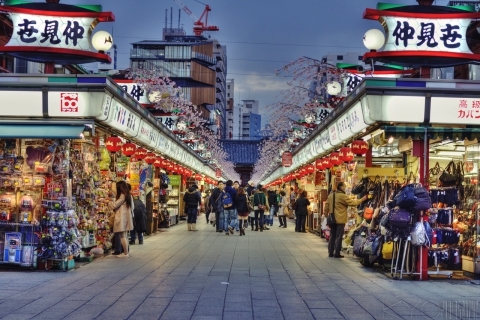 Through the JR Yamanote get to Kando station (2 min., 140 yen), make a change to the subway line Ginza Subway Line and go to Asakusa station (10 min., 170 yen). According to the Orange Line JR Chuo Line Kando get to the station (10 min., 170 yen), make a change to the subway line Ginza Subway Line and go to Asakusa station (10 min., 170 yen). From Narita to Asakusa trains Keisei Limited Express, Keisei Skyliner, JR Narita Express.